Do you have any burial ceremony or funeral plan in place after the demise of a close friend or family member? As a matter of fact, death is inevitable. However, the deceased deserve a befitting burial or funeral ceremony as a last farewell. You can organize a befitting burial ceremony and memorial service by hiring the services of a professional agency providing top class Funeral Homes in Fort Myers Florida. This will make it possible for you to appreciate the wonderful memories you once had together and the good influence they made in your life during their lifetime. We also offer a wide variety of Fort Myers funeral caskets if you prefer a traditional burial. If you are in search of top-notch Fort Myers Funeral Homes to give your deceased friend or family member befitting funeral ceremony or funeral service, you can count on Baldwin Brothers a Funeral & Cremation Society in Fort Myers to get the job done. For several years now, we have been helping family members all over Fort Myers, Florida, and nearby cities take charge of their burial planning. We are known to deliver exceptional, top class Funeral Services in Fort Myers, Florida. Baldwin Brothers Funeral and Cremation Society along with Dignified Funeral Homes remain your number one provider of memorial services and funeral homes in Fort Myers, Florida. As a reputable Fort Myers funeral home, we have provided compassionate and personalized face-to-face communication with families throughout Florida. We will always be the perfect Funeral Homes Fort Myers, FL to offer the departed soul a high-class funeral service. At Baldwin Brothers a Funeral & Cremation Society, we rely on upfront pricing and a 24-hour open door policy in order to maintain a feeling of reverence and respect for families in need of compassionate care. We understand the stress and confusion that often accompanies the loss of a loved one, and we are committed to providing guidance and understanding as a professional funeral home in Fort Myers. 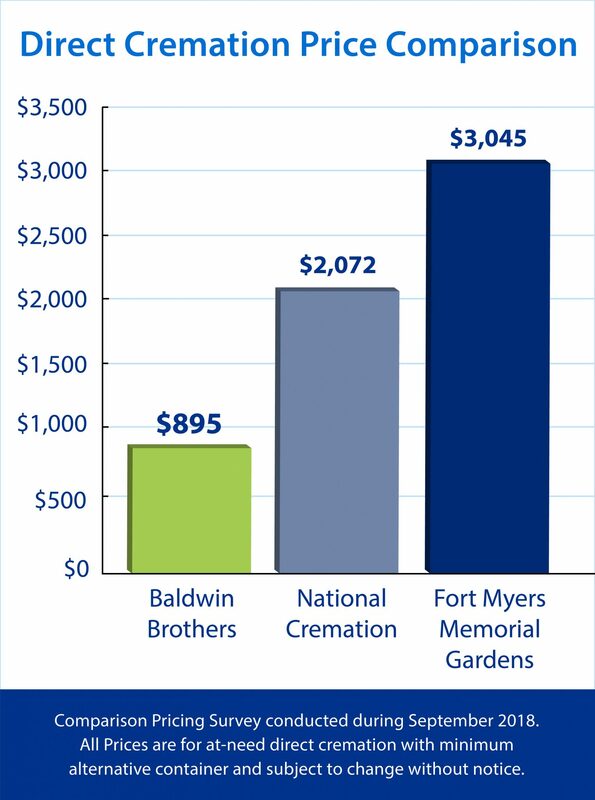 At Baldwin Brothers, we are pleased to be one of few Fort Myers funeral homes able to provide prompt, accurate, and affordable direct cremations with access to our own personal crematorium. Our cremation services in Fort Myers feature some of the leading technology available, including Security Trust tracking system. At Baldwin Brothers a Funeral & Cremation Society, we are always ready to be there for you starting from the planning stages until the concluding stage of the funeral service. Our unique variety of keepsake memorabilia allows families to create a physical and enduring reminder of lost loved ones. In addition to decorative urns and beautiful floral arrangements, we offer unique custom-designed jewelry. You can choose from a variety of beautiful charms that have sealed inside a sample of your loved one’s ashes, a lock of hair, or even flower petals with which to cherish the memory forever. Many families also choose to have thumbprint preserved in gold or silver and worn on a charm. A caring expert at a Fort Myers funeral home will be happy to assist with a multitude of creative and inspiring ways to honor the legacy of the deceased. All these and much more are some of the things that set us apart from other Funeral Homes in Fort Myers Florida. Contact a Fort Myers Funeral Home Today! Whether you are considering traditional burial or cremation services in Fort Myers, it is never too soon to begin planning your final wishes. Our Lunch and Learn seminars help families to understand and consider the many various options and details that are commonly overlooked when families are forced to rush through last-minute arrangements. We remain the most-preferred Funeral homes in Fort Myers, FL to handle the burial ceremony and funeral service. We pride ourselves on service that focuses on the guidance and compassion necessary to families to enjoy meaningful and dignified afterlife care, and we guarantee full satisfaction or else issue a full refund. Baldwin Brothers proudly serve Bonita Springs, Cape Coral, Naples, Estero, Lehigh Acres, Port Charlotte, Punta Gorda, Sanibel Island, Collier County and Lee County. Don't hesitate to contact us today for all your Fort Myers Funeral Home needs.